Advertising agency based in San Francisco/San Mateo area. Offers portrait, weddings and commercial services. Based in San Mateo. Architectural firm specializing in healthcare projects from clinics to acute hospital facilities. San Mateo, California. offers charter service in the bay area and the western united states, using vehicles seating 14 to 36 passengers. Distributors of Computer, networking cables and accessories. Test equipment for telco, network systems. Find out about home valuation services for San Francisco, San Mateo, Marin, Alameda and Contra Costa counties. San Mateo CPA firm offering tax, accounting, litigation support, business valuation, and estate planning services. A residential real estate appraisal firm serving San Mateo, Santa Clara, San Francisco, and Alameda Counties in Northern California. San Francisco, Marin, and San Mateo offices service mid-market closely held businesses and high-net-worth individuals. Real estate appraiser in San Jose, California providing appraisals for Santa Clara, San Mateo, Alameda, and San Benito counties. Find out about valuation services in San Francisco and San Mateo County, includes qualifications, types of appraisals offered, and contact information. Foreign voltage transformers and converters for computers and other electronic equipment. Rich Polonsky provides residential and investment mortgage financing for San Mateo and the state of California. A locally owned and managed one-unit community bank serving San Mateo, California. San Mateo full service firm. Includes service-bureau-supplied newsletter, financial calculators, and tools. Services Alameda, Marin, San Francisco, San Mateo, Santa Clara counties. Includes on-line order form, glossary of terms, and contact details. Full-service design firm for commercial and residential design, architecture and construction. Locations in San Francisco, San Mateo and Santa Cruz counties. Home meal delivery service in San Mateo. Also offers catering, wine tasting events, and cooking class parties. Online ordering, chef biographies, frequently asked questions, and contact information. San Mateo accounting firm specializing in audits, business valuation, individual, business, and estate tax planning and preparation. Provides consulting services on CCTV, access control, fire and life safety, and security systems. San Mateo, California. Wedding, event, and commitment ceremony photographer for the entire Bay Area including San Francisco, Sonoma, Marin, Napa Valley, Contra Costa, and San Mateo counties. Online gallery, rates, and testimonials. Services Santa Clara, San Mateo, Alameda, San Francisco, Santa Cruz, and Contra Costa counties. Includes fee schedule, related links and contact details. Offering in-home meal preparation, meal delivery service, event catering and cooking instruction. Chef biography, sample menus, and frequently asked questions. Serving Santa Clara, San Mateo, and Alameda counties. Featuring brand and generic medicines direct from Mexico. San Mateo, California specialist in Fostoria and Cambridge glass. Specializes on contemporary and tropical designs and offers orchids and other exotic plants for delivery throughout San Mateo and the Bay Area. Products with natural elements that protect, moisturize, balance, nourish and tone the skin. Also clinic offering services in San Mateo, CA. Features contemporary and exotic designs, plants, and gift baskets for delivery throughout San Mateo and the Bay area. Includes catalog and wire service relay. Specializes in tetsubin/cast iron teapots, kenzan/flower frogs, shears, ceramic teacups, origami, sake containers and cups, tea cups, mugs and gift box sets. Based in San Mateo, California. An evaluation of elements of the San Mateo ordinance with recommendations. A PADI dive center in San Mateo that provides instruction, sales, rentals and service. Naturopathic Doctor and Acupuncturist located in Menlo Park and San Mateo, California. Home of the College of San Mateo (California) Bulldogs Swimming and Water Polo team. Full history of the teams with photos and biographies. Bay Areas premier road, tri, recreational custom/ production, hybrid bicycle shop. Small, family owned, personalized service. One of the most traditional and innovative racetracks in the country, this Thoroughbred racetack also is the longest continually operating racetrack in California. Located in San Mateo. A large Ophthalmology group in San Mateo county. Specialty practice in San Francisco and San Mateo dedicated to the diagnosis and treatment of animal eye diseases. Ophthalmology information, staff profiles, hours of operation, and forums. Pre-school to competitive gymnastics for boys and girls. Programs, birthdays, camps, field trips, coaches, facility. Located in San Mateo. Located in San Mateo, California. Contains an online adoption application, information on neutering and sexing cavies, a special section on pet stores, polls, and links to cartoon movies. Serving San Mateo and Northern Santa Clara county, California. Includes calendar, on-line forms, training information, newsletter, and contact information. Providing quality officials for high school basketball programs in San Mateo County. Located in San Francisco, a nonprofit, free-standing agency that provides both home health and hospice care in San Francisco and San Mateo counties. San Mateo County, San Francisco Bay area horse trail riding. Your fantasy horseback ride is created through some of the best trails in the country. Information on the comprehensive skin care and laser hair removal services provided. Located in San Mateo, California. Emergency fire department incidents with live audio and photos from the scene. Covers San Mateo County, Santa Cruz County, and the San Ramon Valley. Volunteer equestrian search and rescue team in California. Includes unit overview, administration, calendar, news, and links. Unofficial website covers the fire department and other San Mateo County fire agencies. Dr Kasia Hopewell, N.D., a licensed doctor in San Mateo, California, offers holistic and comprehensive medicine for the whole family. The Ice Oasis skating rink is located in Redwood City in San Mateo county, California. Open year round with 180 x 85 rink, four team locker rooms, seating for up to 300, a snack bar and viewing lounge. Search engine marketing and web design. Located in San Mateo, California, United States. Offers web and graphic design, marketing, print, and promotion. Located in San Mateo, California. Offers CCNA , CCNP and MCSE bootcamp training. Training locations in College Park, MD and San Mateo, CA. Schedule, tournament results, and photos. Club news, tournament information, and chess links. the san mateo county sheriffs offers information on employment, community policing, correctional facilities, civil and records bureau along with emergency services. immigration attorney based in san mateo. san mateo criminal defense attorney. san mateo criminal defense lawyer. Profile and photos, in San Mateo, California. personal injury law firm based in san mateo. serves san mateo county. offers services, faqs, rates, and contacts. serves san mateo and san francisco counties. features faqs services, rates, and contacts. San Mateo luxury condominiums for seniors 55+ offering a wide range of services and amenities. Show window of San Mateos Royal Rangers offering contact information. Newsletter, service information, essays on congregational activity, and philosophical statements. California. Features newsletter, contacts, applications, events, and mailing list. provides a dignified burial at sea aboard the riptide out of san mateo, san francisco, california. Roller skating session held at the San Mateo Rolladium. Directions and special events. offering legal services to individuals in areas of bankruptcy, divorce, and estate planning, from offices in san mateo. information on employment, community policing, correctional facilities, civil and records bureau along with emergency services. fremont based serving santa clara, alameda, and san mateo counties. includes services, fees, and contacts. family law mediation from offices in san mateo and mountain view. san mateo firm representing investors in the pursuit of claims against stockbrokers. offering services for employment, personal injury, real estate, insurance, intellectual property, and general business matters, from offices in san mateo. san mateo attorney focusing on intellectual property licensing, commercial real estate leasing, business transactions, and small company formations. Located in San Mateo, California and established 13 years ago, services are available with premarital, marital and individual counseling issues. Irish pub in San Mateo, California. half moon bay-based firm serving san mateo county. includes list of services, locations, officiant, marriage license information, ceremony outline, and reading list. employment information for sheriffs department. Biography, list of publications, and contact email. San Mateo, CA. dj and producer duo from the us. includes biography/discography, dj sets, and label information. One-page history of Mid-Coast Television Channel 6, San Mateo, California. Public Access. Anime convention in San Mateo, California. MCTV is a non-profit community access television station serving the coast in San Mateo County, California. Minneapolis based group featuring Colette 'La Canela' and Mateo. Site includes performance calendar, information on educational programming, perspectives on flamenco, and a message board for news and discussion. SiteBook San Mateo City Portrait of San Mateo in California. 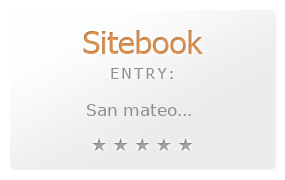 This Topic site San Mateo got a rating of 3 SiteBook.org Points according to the views of this profile site.